Photos and narrative courtesy Ted Smith. 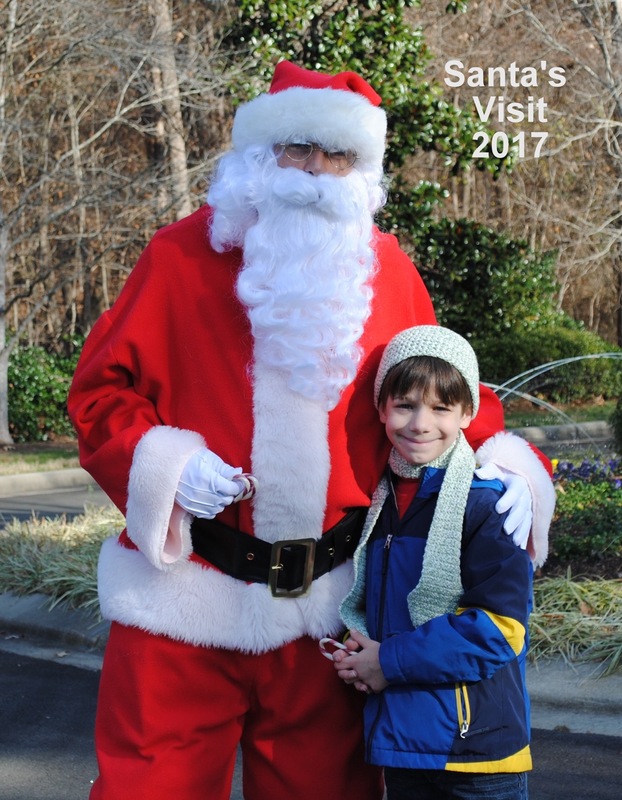 On the bright, sunshiny afternoon of December 16, 2017 Santa visited the Governors Village neighborhoods on his way back to his North Pole workshop. 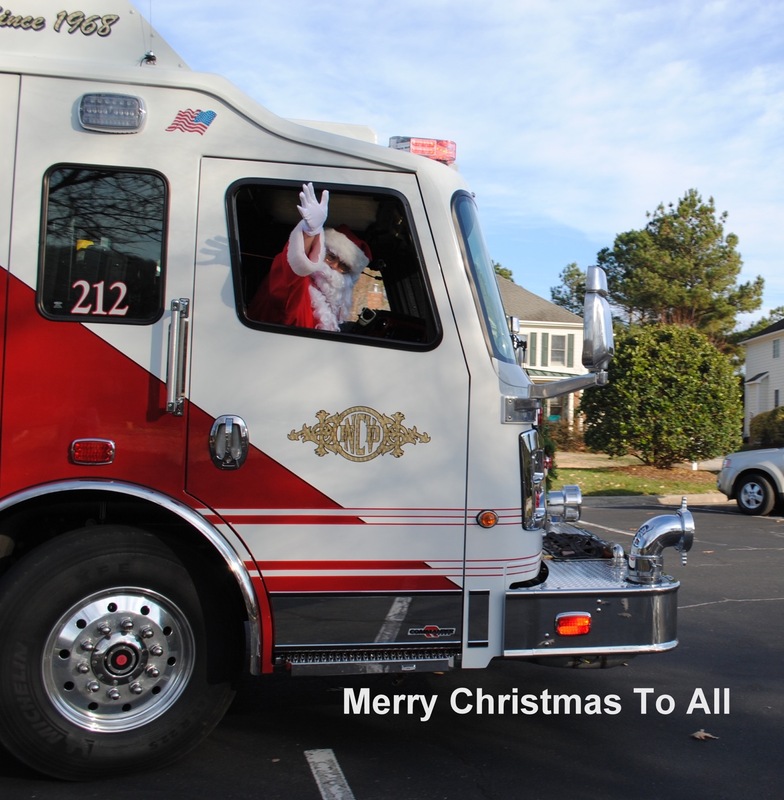 His reindeer were being well cared for by the Chatham County Firefighters as they drove him around in their fire truck giving the reindeer including Rudolph a well deserved rest. The Governors Village Social Committee arranged for this visit and Santa brought lots of candy canes for everyone. Children of all ages came out to welcome Santa and the children were able to let him know the gift they really, really wanted this Christmas. The children said they were never naughty always very well behaved. Santa listened to their wishes and gave each boy and girl a candy cane made by Mrs. Claus. 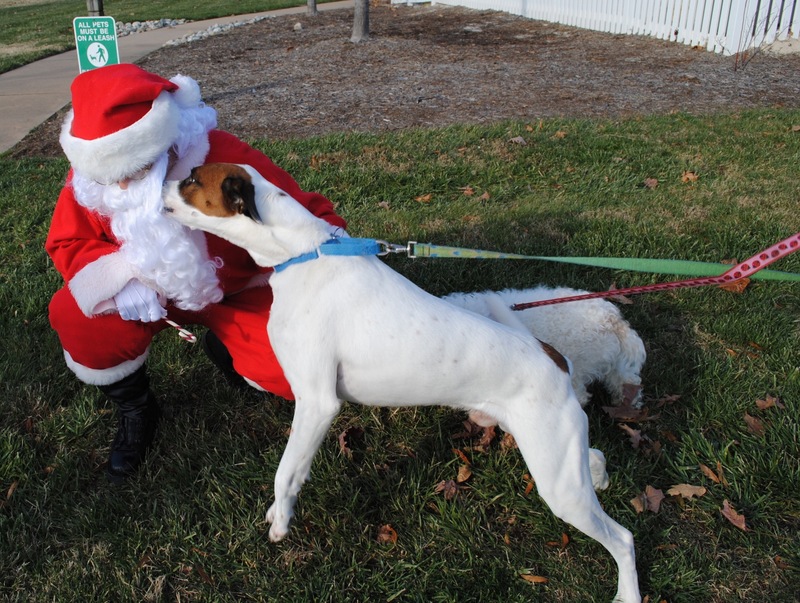 Even a couple of four-legged friends came to see Santa. At each neighborhood parents were able to take family photos before Santa had to leave to head North. His sleigh and reindeer were at the firehouse all ready for the trip back. 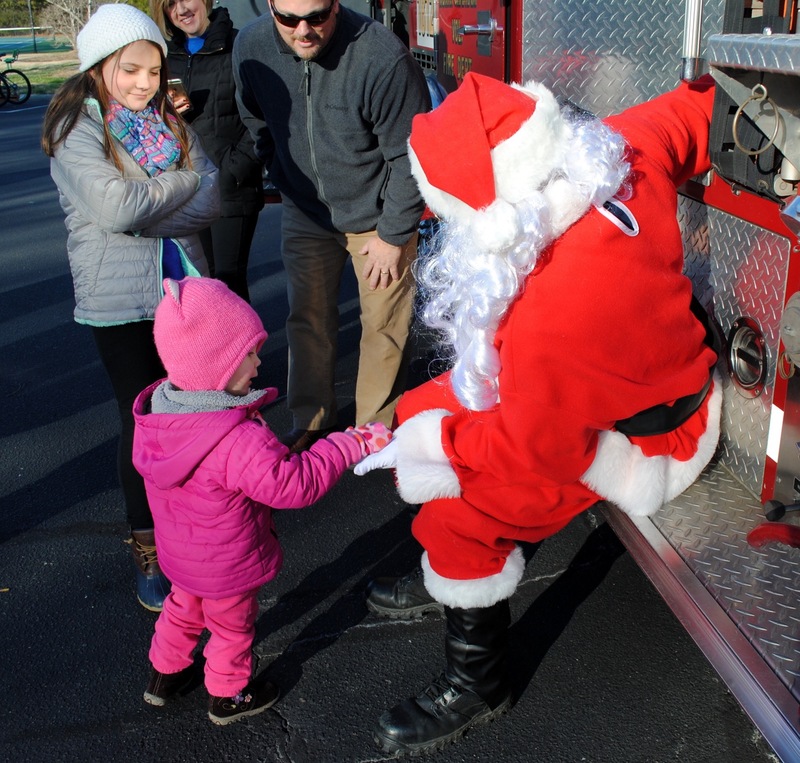 Click to view the slideshow from Santa’s visit. Merry Christmas to all and may all your sweet dreams come true. This entry was posted in gv Other and tagged santa visit on December 18, 2017 by govvillage. The Governors Village Social Committee has planned two holiday events for 2017. Santa is coming and so are sky-gazing guides from the Morehead Planetarium. See the attached flyer for more details. The Social Committee also has arranged an exciting new activity this holiday season. On Friday, December 22, 2017, sky watching experts from Morehead Planetarium will join us to provide a laser guided sky tour with star charts. They will also bring two telescopes so we can view far off stars and planets. Learn about the night sky while sipping hot cocoa with neighbors. This family event takes place at the stadium steps in Governors Park 6-7pm (weather permitting). Another holiday event to keep in mind is the 17th Annual Governors Village Luminary Night December 16, 2017, sponsored by the Watkins Family. This entry was posted in gv Events, gv Social and tagged luminaries, santa visit, sky watch on December 6, 2017 by govvillage. On a chilly December 10, 2016 afternoon Santa visited the Governors Village neighborhoods on his way back to his North Pole workshop. His reindeer were being well cared for by the Chatham County Firefighters as they drove him around giving the reindeer a well deserved rest. The Governors Village Social Committee arranged for this visit and Santa brought lots of candy canes for everyone. Everyone came out to welcome Santa and the children were able to let him know the gift they really, really wanted this Christmas. The children said they were almost always nice except for that one time they were a little naughty. Santa listened to their wishes and he will do his best to fulfill them. At each stop parents were able to take family photos before Santa had to leave to head North. His sleigh and reindeer were at the firehouse all ready for the trip back. Event Sponsored by the Social Committee for residents of the Governors Village community (Governors Forest, Village, Park, Townes and Lake). This entry was posted in gv Photos, gv Social and tagged santa visit on December 12, 2016 by govvillage.